Ever since I hopped onto the exfoliating toner bandwagon a while ago starting with one from Hada Labo and then continuing with the REN Skincare Clarimatte toner, both of which I’d finished to their very last drop; one brand had been tugging away at the edge of my consciousness. This was a product that came highly raved by many prominent skincare bloggers who I highly respect for their opinions, and I just had to find a way to get it. 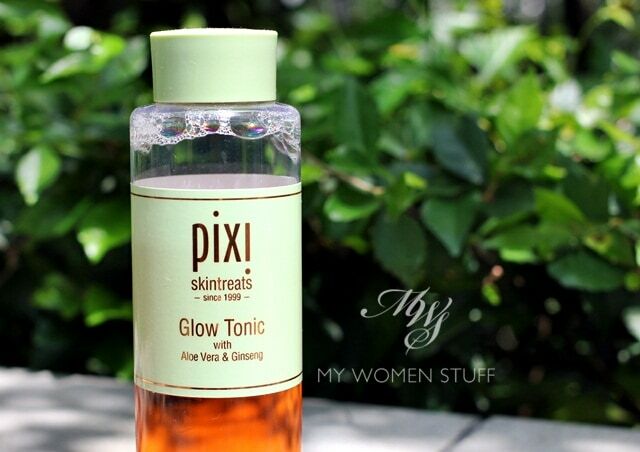 The product is the Pixi Glow Tonic and it comes highly rated by acclaimed skincare guru Caroline Hirons (who I adore and have learned a lot from btw, even if I may not agree with everything because some things don’t work for my skin and I know that); and better yet, it’s available online with international shipping! I love webstores that ship internationally for free or a small fee, and I find stores based in the UK are very good about this, which is why I buy a lot of my skincare from the UK. Pixi is the brand, which some of you may recognise, is also a brand that makes some quite cute makeup and makeup sets. To be honest, as I’m not as well trained in reviewing ingredients that goes into skincare, I would not have given this a second look, due to its makeup origins. This is why I have to let other more experienced and cleverer people do it for me 😛 I just come in to give it a go to see if I like it. Ms. Hirons says that this is a dupe of the Biologique Recherche Lotion P50 (another product that I’m dying to have a go at, but which is near to impossible to find online as the dodo – if you know a website that will ship it internationally without me having to mortgage my house to do so, please let me know!) and she loves the Lotion P50 so at the first opportunity, I picked up a bottle online to see what the hype was about. What the Glow Tonic is, is an exfoliating toner. If you’ve been with me a while, you’ll notice that I use 2 toners/lotions – one to exfoliate and one to hdyrate after that. The exfoliating toner removes dead skin cells gently, so skin looks better and clearer and in the case when I get spots, heal more quickly. From my experience, it also seems to help products absorb better into the skin, which would be logical. There are many brands out there now, and I’ve thus far only tried very few but am always experimenting. Pixi’s Glow Tonic is such a lotion. It comes in a plastic bottle with a screw on cap, and the liquid is a clear bronze-orange colour. I’ve used it for a while now, as you can tell from the reduced quantity in the photos (I don’t take photos of brand new products anymore unless I have the time and energy to do so, so please expect photos of used products on my blog 😛 ) and I must say that I’m a little unsure as to how I feel about this. After reading all the raves online, I feel like after almost 2 months at it, I should have this wonderful revelation with angels singing Hallelujah on high, and skin so glowing, I could be seen in the dark. But I haven’t. Granted, that’s not quite what it promises. 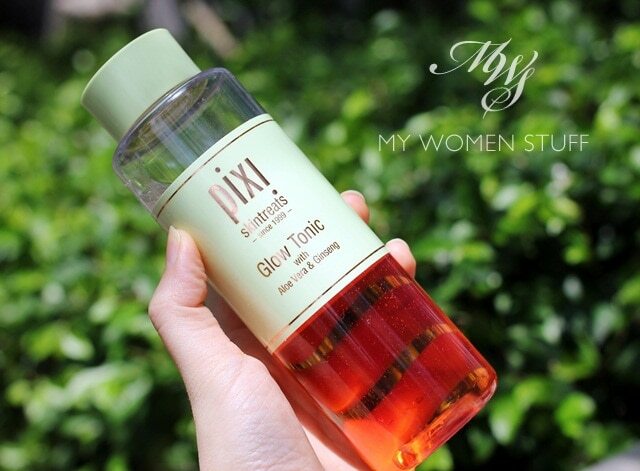 What the Glow Tonic promises is to exfoliate and oxygenate skin, and tone, lift and tighten. What I can attest to is a perceptible improvement in skin quality IF you start out with a dull skintone. That’s what happened to me. After I finished my REN toner, I stopped using exfoliating toners for a while and I basically fell off my skincare routine for a little over a month. With the neglect, my skin did look noticeably more dull. So, when I got myself together again and back into my stringent routine, incorporating Glow Tonic, I did notice improvements. Used day and night, using a cotton pad, I did notice that my skin started to look better and clearer. When my pores feel a little clogged, I go over the areas a few times with the saturated cotton pad and over a few days, it does seem to feel help unclog my pores and it feels clearer. If I get a pimple or a spot, this seems to help it heal more quickly. It’s the glycolic acid in there. Once the initial improvement is past, then I suppose it comes down to maintenance, because that’s how I feel right now. At this moment, I feel like this Glow Tonic is maintaining the quality of my skin. So, if you already have clear skin or have already been using an exfoliating toner regularly before switching to Glow Tonic, you MAY NOT notice a marked improvement. But don’t pan it because of that. It could just be that your skin is at its optimum and you couldn’t improve it any further. It happens to me sometimes. I however, did not notice firmer or tighter or brighter skin. My skin pigmentation is still there. However, I do feel that all that has a lot to do as well with other factors. I certainly did not expect a lotion/toner to do that job. It feels refreshing, it isn’t drying nor does it feel tight against my normal-dry skin and it doesn’t sting. It does seem to prep my skin so whatever I put on next absorbs better. However, if you ask me if my skin is looking better, I’d say that it’s hard to say. After 2 months, and bearing in mind that I also use a lot of other products that I think also do a very good job, I think it’s doing a good job at maintenance. I must however, mention one thing I have not managed to get over since my first use – the smell. I can’t quite describe the smell except to say that it smells like mild fragranced soap to me. It isn’t very strong nor does it linger, but it’s there, so it does make me pause when I’m asked if I will repurchase this. I will, because I do like it for what it does for my skin. But that smell makes me hesitate from committing wholeheartedly. 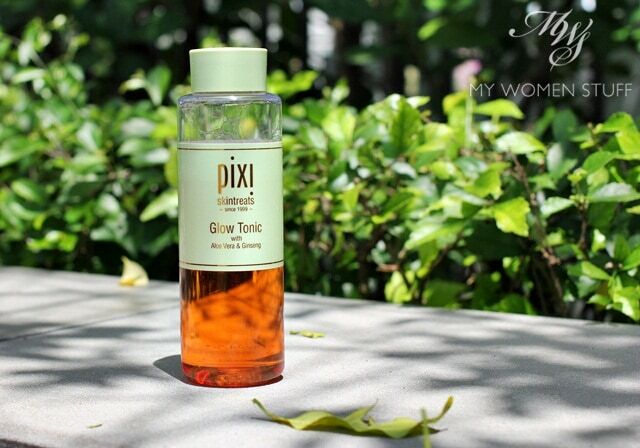 The Pixi Glow Tonic is a bit of a cult product and used to be practically impossible to find because people would hoard it whenever they saw it. However, it is now available online (internationally) so it’s a lot easier to get hold of. This is an exfoliating toner that you use after cleansing and before all your other skincare products. It helps to exfoliate dead skin cells, and leave you with clearer, brighter skin. I find that this does help me bring a bit of even tone and radiance to dull skin but after a while, it will simply maintain the texture and condition of your skin. So, if you are using this hoping to see significant results, I think you’d need to start with very dull and troubled skin. If you already have fairly clear skin or are already using similar products regularly, you may not notice a marked improvement and will likely be disappointed. I do however, have to note the smell that I don’t find pleasing. However, few people mention it so maybe it’s just me. Here is the ingredient list so you can see if there’s anything in there you can’t use. Have you tried this highly acclaimed Glow Tonic? Do you use an exfoliating toner? PREVIOUS POST: Your say: What is your bedtime routine? Do you have one? NEXT POST: Feeling Down? Dress Up and Make Up and things will look up! Sounds ok ok for me.. anyway Miss P what are the websites u usually get the probucts from UK? Hmmm, interesting! I want to try this since I’m on a skincare kick. 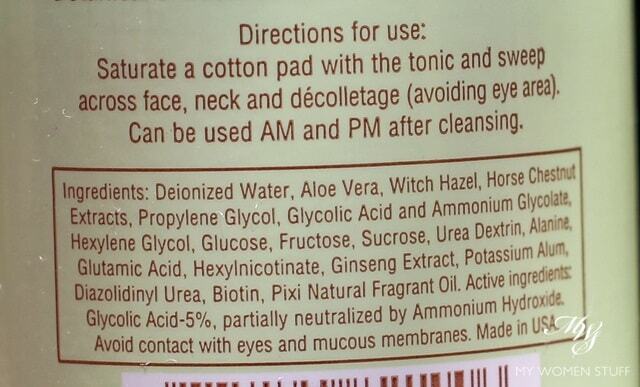 I see it has glycolic acid -maybe it’s a version my skin ca tolerate. I had no idea they ship internationally, so that’s great! There’s always malic acid or lactic acid if you can’t tolerate the glycolic well. Another product i want to try from PIXI also raved by Ms. Hirons is the beauty primer. I think i pass this toner though. I’ll continue with my neal’s yard’s. I’m a reader of Caroline’s blog but I often disagree with her. Maybe I read it just for amusement? I have tried the Pixi Glow tonic but I much prefer a BHA exfoliate since I have acne and suffer from random breakouts, I just find that using a BHA keeps em’ nasties at bay. Nevertheless, compared to the P50, this seems like a bargain! It also makes my skin smoother the next day but imo, other products triumphs over this sadly. But not repurchase material for me though. I don’t get (yet) why this is so hyped. I love my Alpha-H liquid gold and the Biologique Recherche P50 is amazing even if it smells like vinegar. They’re my 2 glow boosters and I only use them when I know I need some pore de-clogging overnight or need to up the glow. I wanted to use REN’s when I read about it on your blog. Somehow along the way of wanting to purchase it, I got distracted by another exfoliating toner. So far, so good. Complexion seems clearer and brighter. This one by Pixi is interesting. No comments about it since I have yet to try it. Maybe one fine day I would. Yes, that did bug me especially with the odd smell. I have read that Pixi has been criticised for this strange ingredient because it doesn’t fit the regulatory manner of disclosing the ingredient list. It would have been far better without any fragrance IMO! I don’t really use BHA exfoliants I’m afraid, so I don’t really have a recommendation. But I hope someone who does see your query will help! Heh, it’s Doctor Line Enzyme Cleansing water, an AHA exfoliator. It’s not a toner but I’m using it as such – you’re supposed to wipe away dirt and dead skin with it then rinse it off, but I was able to build up a tolerance to leaving it on my skin like a toner. At 4000 yen for 140mL I don’t know if I’ll repurchase, but it seems okay for me. The pump is a bit aggressive about dispensing product – hold the cotton tilted as the product comes out horizontally, not down! There’s a bit of a scent but I don’t mind it.